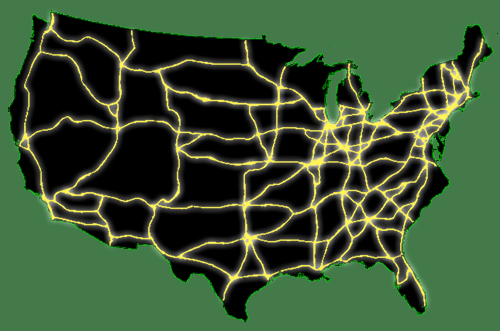 Two weeks ago it was announced that Solar Roadways received a $100,000 grant from the US DOT to prototype their idea for a “decentralized, secure, intelligent, self-healing power grid” that would “end dependence on fossil fuels and revitalize the economy”. I first saw it here on inhabitat. This follows on many other road-related energy generating ideas for the unused right-of-way areas on the sides and medians of roads. These include the Green Roadways Project, ideas for micro-generation turbines in jersey barriers, and state-financed linear solar farms along highways. There are even prototypes being built with piezoelectric energy harvesting devices embedded in the road surface itself. These are all fascinating ideas. Hopefully as we progress from the research and development phase and into the prototype and commercial viability phases, there is also a level of thought around aesthetics and the usefulness beyond the level of utility of what are sure to be extremely visible installations that will be passed by millions of drivers on a daily basis. I’m sure that integration with billboards and other advertising media will be in the works as these turbines and linear solar farms begin to make a more ubiquitous appearance on the periphery our highways. As for the actual road surfaces providing a continuous smart grid, the Solar Roadways version is intriguing but I wonder if there would be a way to embed a more nano-scale technology into a surface that is pour-able and plastically mend-able rather than one that is more macro-mechanical and panelized. I’m sure that the inventors are working on the material properties and stability but the heaving of the freeze-thaw cycle in northern climates will surely be of grave concern to such rigid modules. The potential to have vehicles that are constantly powered off of such a road system is of course the next step in the enticing arc of this narrative. The transition to this would be probably in phases, the first of which would be powering stations that are fed from the solar-road grid. The next would be to transfer the energy on the fly. A system being developed in Korea would embed the hardware for such a transfer in the road surface. Another idea would be to use the recently resurgent ideas of wireless energy transfer to provide a field of energy through which vehicles would pass. The devices that would generate this energy field would be placed at the shoulder of the roadway at sufficient intervals. Hopefully such devices would be designed to be appealing to the eye. They could even have the added benefit of acting as noise canceling devices by sending out inverted sound waves of the real-time noise emitted from the passing traffic.